Liu, K. and Hu, J. (2018). Host-regulated Hepatitis B Virus Capsid Assembly in a Mammalian Cell-free System. Bio-protocol 8(8): e2813. DOI: 10.21769/BioProtoc.2813. The hepatitis B virus (HBV) is an important global human pathogen and represents a major cause of hepatitis, liver cirrhosis and liver cancer. The HBV capsid is composed of multiple copies of a single viral protein, the capsid or core protein (HBc), plays multiple roles in the viral life cycle, and has emerged recently as a major target for developing antiviral therapies against HBV infection. Although several systems have been developed to study HBV capsid assembly, including heterologous overexpression systems like bacteria and insect cells, in vitro assembly using purified protein, and mammalian cell culture systems, the requirement for non-physiological concentrations of HBc and salts and the difficulty in manipulating host regulators of assembly presents major limitations for detailed studies on capsid assembly under physiologically relevant conditions. We have recently developed a mammalian cell-free system based on the rabbit reticulocyte lysate (RRL), in which HBc is expressed at physiological concentrations and assembles into capsids under near-physiological conditions. This system has already revealed HBc assembly requirements that are not anticipated based on previous assembly systems. Furthermore, capsid assembly in this system is regulated by endogenous host factors that can be readily manipulated. Here we present a detailed protocol for this cell-free capsid assembly system, including an illustration on how to manipulate host factors that regulate assembly. The hepatitis B virus (HBV) is an important global human pathogen that chronically infects hundreds of millions of people worldwide and represents a major cause of viral hepatitis, liver cirrhosis, and liver cancer (Seeger et al., 2013; Trepo et al., 2014). HBV replicates its genomic DNA, a relaxed circular, partially duplex DNA (RC DNA), via reverse transcription of an RNA intermediate, the so-called pregenomic RNA (pgRNA), within a nucleocapsid (NC) (Summers and Mason, 1982; Hu and Seeger, 2015; Hu, 2016), which packages a copy of pgRNA together with the virally encoded reverse transcriptase (RT) protein (Bartenschlager and Schaller, 1992; Hu and Lin, 2009). It is within NCs that the RT converts pgRNA into RC DNA. The icosahedral HBV capsid shell consists of multiple copies of a single viral protein, the HBV core (capsid) protein (HBc). HBc is composed of an N-terminal domain (NTD, aa 1-140) and a C-terminal domain (CTD, 150-183 or 185 depending on strains), which are connected by a linker region (141-149). In heterologous overexpression systems including bacteria and insect cells and in vitro assembly reactions using high concentrations of purified HBc and/or salt, NTD alone, without CTD, is sufficient for capsid assembly; thus it is also called the assembly domain (Gallina et al., 1989; Birnbaum and Nassal, 1990; Lanford and Notvall, 1990; Wingfield et al., 1995). Though not required for capsid assembly in these systems, the highly basic and arginine-rich CTD shows non-specific nucleic acid binding activities (Hatton et al., 1992) and plays important roles in viral RNA packaging (Nassal, 1992), DNA synthesis (Nassal, 1992; Yu and Summers, 1994), and nuclear import of capsids (Liao and Ou, 1995; Liu et al., 2015), all of which is further regulated by the dynamic phosphorylation state of CTD controlled by host factors (Kann and Gerlich, 1994; Kann et al., 1999; Daub et al., 2002; Ludgate et al., 2012; Liu et al., 2015). Whether CTD, and its state of phosphorylation, play a role in capsid assembly under physiological conditions remained unclear. To study HBV capsid assembly under more physiological conditions, we have recently developed a mammalian cell-free assembly system based on the commonly used mammalian cell extract, rabbit reticulocyte lysate (RRL), in which HBc is expressed at physiological (low) concentrations (25-50 nM, monomer) and assembles into capsids under near-physiological conditions (Ludgate et al., 2016). This system allowed us to reveal an unexpected role of CTD in capsid assembly, which is further subjected to regulation by the state of CTD phosphorylation as controlled by endogenous host factors (Ludgate et al., 2016). This protocol is adapted from Ludgate et al. (2016) and more detailed information on this cell-free capsid assembly system is included, and different treatments are applied to address the roles of viral and host factors, such as RNA-binding activities of CTD and host phosphatases, in HBV capsid assembly under near-physiological conditions. This protocol will facilitate detailed studies on capsid assembly and host regulation under physiological conditions and identification of novel antiviral agents targeting HBc. Treat plasmid DNA with Proteinase K and SDS to remove any contaminating RNases in plasmid DNA. 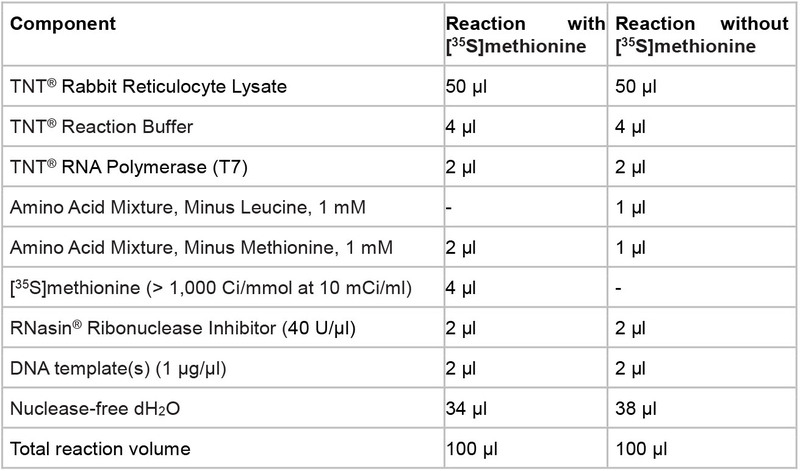 As shown in the table below, incubate HBc-expressing plasmids with SDS (final concentration 0.6% w/v) and Proteinase K (final concentration 0.4 µg/µl) at 50 °C for 30 min. Always dilute 20% of SDS in the TE buffer first before adding Proteinase K.
Any plasmid vector containing a bacteriophage promoter (T7 in the example below) that can be used for in vitro transcription using the cognate phage RNA polymerase can be used for coupled transcription and translation in this system. Add an equal volume (200 µl) of phenol to the digestion reaction, mix well and spin at the maximal speed (17,000 x g) for 5 min at room temperature. Transfer the aqueous (top) layer to a new tube and repeat this step. Add an equal volume of chloroform and extract once as described in Step A2. Measure the aqueous solution and add an appropriate volume of 3 M of sodium acetate (final concentration at 0.3 M) and 100% of ethanol (final concentration at 70%), mix well and incubate at -20 °C for 30 min. Centrifuge at the maximal speed (17,000 x g) for 20 min at 4 °C and wash the pellet 3 times each with 1 ml of 70% ethanol, with spinning at the maximal speed for 10 min at 4 °C. 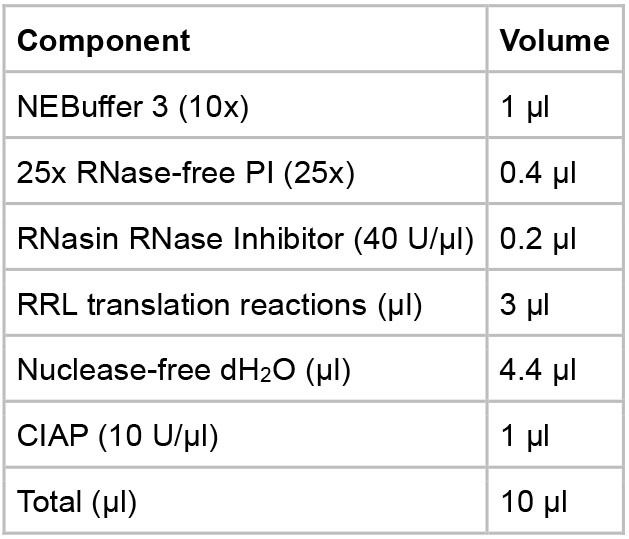 Resuspend DNA with 30 µl of RNase-free water. Measure DNA concentration with a spectrophotometer (NanoDropTM 1000) and adjust the DNA concentration to 1 µg/µl and then verify DNA integrity by agarose gel electrophoresis. 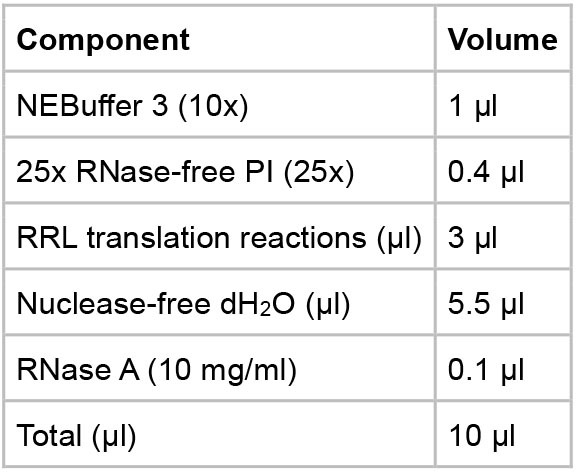 A TNT® Coupled Rabbit Reticulocyte Lysate (RRL) in vitro translation system (Promega) is used to express the HBc protein as recommended by the manufacturer. Put TNT® RNA Polymerase (T7) on ice. Quickly thaw the TNT® Rabbit Reticulocyte Lysate by hand-warming and immediately put on ice. Thaw the other components at RT (25 °C) and put on ice. The TNT® Reaction Buffer may contain a precipitate after thawing and sitting on ice. Redissolve the precipitate by vortexing at room temperature for 30 sec. Do not freeze-thaw the lysate more than twice. Any unused lysate should be refrozen in a dry ice/ethanol bath as soon as possible after thawing to minimize loss of translational activity. Assemble the reaction components in a 1.5 ml microcentrifuge tube following the table below. Note: Small-scale reactions may be performed by reducing all components proportionally. Incubate reaction at 30 °C for 90 min. Put the reactions on ice and proceed to the assembly steps or store the reactions at -80 °C for future use. Except for the actual translation incubation, all handling of the lysate components should be done at 4 °C or on ice. 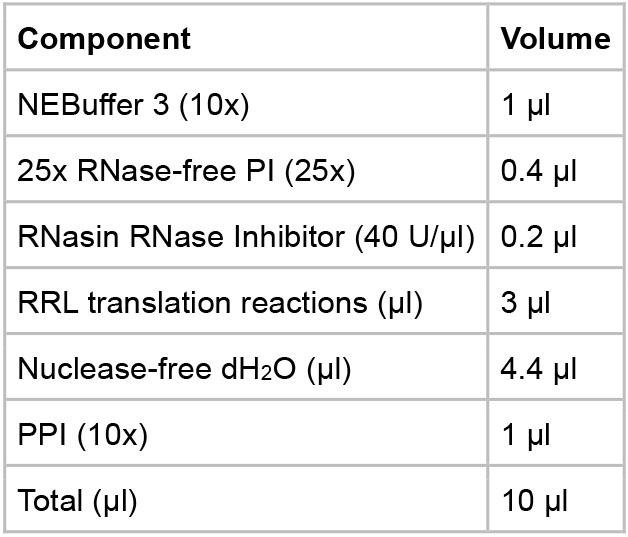 Add RNasin® Ribonuclease Inhibitor to all TNT® Lysate reactions to prevent RNA degradation. Microcentrifuge tubes and pipette tips should be RNase-free. 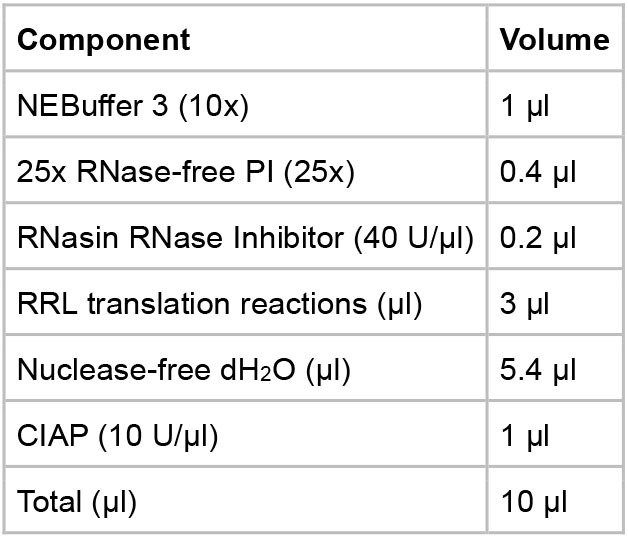 Use a cleaning agent (such as RNaseZAPTM) to clean the bench and gloves to remove RNase. Our recent studies have shown that both HBc NTD and CTD are required for HBV capsid assembly at physiologically low HBc concentrations translated in RRL (Ludgate et al., 2016). CTD likely facilitates assembly under these conditions via RNA binding and protein-protein interactions. Moreover, CTD is subject to phosphorylation and dephosphorylation by endogenous host kinase(s) and phosphatase(s) in RRL, which further regulates capsid assembly. 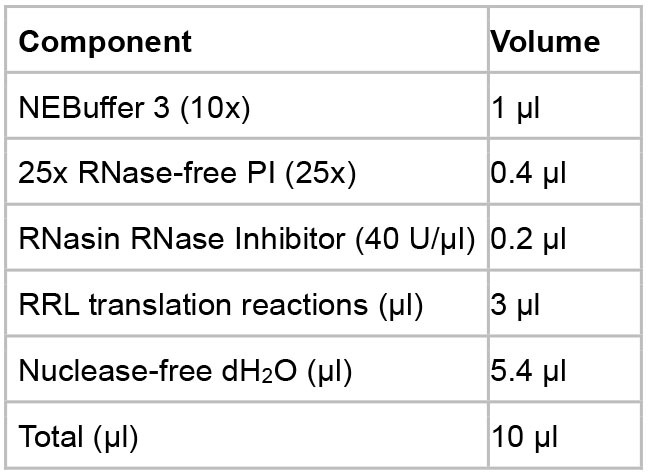 To confirm the roles of CTD in capsid assembly in RRL, especially its RNA binding activity and regulation of assembly by phosphorylation state, the following treatments, as shown in Figure 1, are applied to the HBc in vitro assembly assay in RRL. Figure 1. Conditions for in vitro capsid assembly in RRL. Mock, the reaction is incubated at 37 °C for 16 h without any treatment. CIAP, CIAP (10 U/µl) is added in the reaction during the assembly incubation. CIAP + RNase, RNase A (0.1 mg/ml) is added and incubated for another 1 h after the CIAP incubation. RNase + CIAP, the reaction is treated with RNase A before the CIAP incubation. PPI, PPI (1x) is added during the assembly incubation. PPI, a mixture of phosphatase inhibitors (see Recipes below), CIAP, calf intestinal alkaline phosphatase. Note: PI, a mixture of protease inhibitors (see Recipes below). Incubate the reaction at 37 °C for 16 h.
Put the reactions on ice and proceed to the analysis steps or store the reactions at -80 °C for future use. 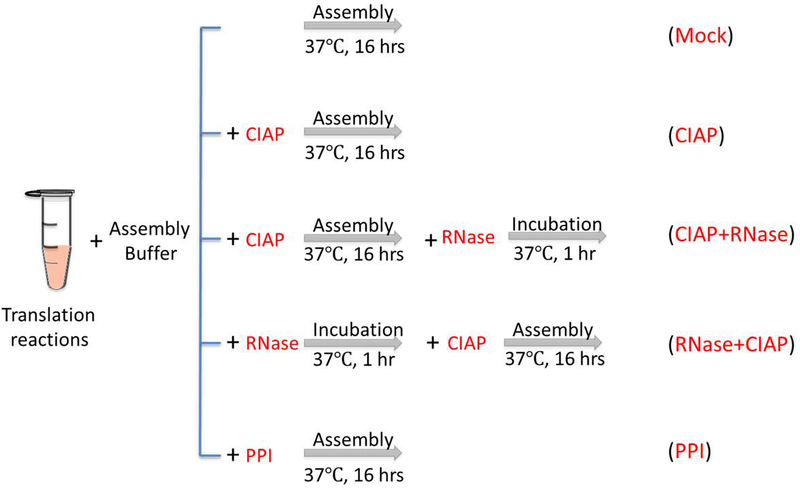 Add 0.1 µl of RNase A (10 mg/ml) to the assembly reaction and incubate at 37 °C for another 1 h.
Incubate the reaction at 37 °C for 1 h.
Add 1 µl of CIAP (10 U/µl) to the assembly reaction and incubate at 37 °C for another 16 h.
All work with [35S]methionine should be done with appropriate precautions and personal protective equipment like gloves and lab coat during all the operations. It is recommended to open the stock in a fume hood as [35S]methionine is volatile. Tools and equipment, such as PIPETMAN, centrifuge and incubators should be checked for contamination after using [35S]methionine. The expression of HBc and capsid assembly in this cell-free system can be examined using SDS-PAGE, agarose gel electrophoresis, and Western blot, as shown in Figure 2 and Ludgate et al., 2016. This protocol is adapted from Ludgate et al., 2016. This work was supported by a Public Health Service grant (R01 AI043453 to J.H.) from the National Institutes of Health. K. L. is supported by a Scientific Research Staring Foundation (15042169-Y) from Zhejiang Sci-Tech University. The authors declare no conflicts of interest. Bartenschlager, R. and Schaller, H. (1992). Hepadnaviral assembly is initiated by polymerase binding to the encapsidation signal in the viral RNA genome. EMBO J 11(9): 3413-3420. Birnbaum, F. and Nassal, M. (1990). Hepatitis B virus nucleocapsid assembly: primary structure requirements in the core protein. J Virol 64(7): 3319-3330. Daub, H., Blencke, S., Habenberger, P., Kurtenbach, A., Dennenmoser, J., Wissing, J., Ullrich, A. and Cotton, M. (2002). Identification of SRPK1 and SRPK2 as the major cellular protein kinases phosphorylating hepatitis B virus core protein. J Virol 76: 8124-8137. Gallina, A., Bonelli, F., Zentilin, L., Rindi, G., Muttini, M. and Milanesi, G. (1989). A recombinant hepatitis B core antigen polypeptide with the protamine-like domain deleted self-assembles into capsid particles but fails to bind nucleic acids. J Virol 63: 4645-4652. Hatton, T., Zhou, S. and Standring, D. (1992). RNA- and DNA-binding activities in hepatitis B virus capsid protein: a model for their role in viral replication. J Virol 66: 5232-5241. Hu, J. (2016). In: Hepatitis B virus in human diseases. In: Liaw, Y. F. and Zoulim, F. (Eds.). Humana Press, Springer Chap. 1, pp: 1-34. Hu, J. and Lin, L. (2009). RNA-protein interactions in hepadnavirus reverse transcription. Front Biosci (Landmark Ed) 14: 1606-1618. Hu, J. and Seeger, C. (2015). Hepadnavirus genome replication and persistence. Cold Spring Harb Perspect Med 5(7): a021386. Kann, M. and Gerlich, W. H. (1994). Effect of core protein phosphorylation by protein kinase C on encapsidation of RNA within core particles of hepatitis B virus. J Virol 68: 7993-8000. Kann, M., Sodeik, B., Vlachou, A., Gerlich, W. H. and Helenius, A. (1999). Phosphorylation-dependent binding of hepatitis B virus core particles to the nuclear pore complex. J Cell Biol 145: 45-55. Lanford, R. E. and Notvall, L. (1990). Expression of hepatitis B virus core and precore antigens in insect cells and characterization of a core-associated kinase activity. Virology 176(1): 222-233. Liao, W. and Ou, J. H. (1995). Phosphorylation and nuclear localization of the hepatitis B virus core protein: significance of serine in the three repeated SPRRR motifs. J Virol 69: 1025-1029. Liu, K., Ludgate, L., Yuan, Z. and Hu, J. (2015). Regulation of multiple stages of hepadnavirus replication by the carboxyl-terminal domain of viral core protein in trans. J Virol 89(5): 2918-2930. Ludgate, L., Liu, K., Luckenbaugh, L., Streck, N., Eng, S., Voitenleitner, C., Delaney, W. E. 4th, and Hu, J. (2016). Cell-free hepatitis B virus capsid assembly dependent on the core protein C-terminal domain and regulated by phosphorylation. J Virol 90: 5830-5844. Ludgate, L., Ning, X., Nguyen, D. H., Adams, C., Mentzer, L. and Hu, J. (2012). Cyclin-dependent kinase 2 phosphorylates s/t-p sites in the hepadnavirus core protein C-terminal domain and is incorporated into viral capsids. J Virol 86: 12237-12250. Nassal, M. (1992). The arginine-rich domain of the hepatitis B virus core protein is required for pregenome encapsidation and productive viral positive-strand DNA synthesis but not for virus assembly. J Virol 66: 4107-4116. Seeger, C., Zoulim, F., Mason, W. S. (2013). In: Fields virology. In: Knipe, D. M. and Howley, P. M., (Eds.). Lippincott, Williams & Wilkins, Philadelphia 2185-2221. Summers, J. and Mason, W. S. (1982). Replication of the genome of a hepatitis B--like virus by reverse transcription of an RNA intermediate. Cell 29(2): 403-415. Trepo, C., Chan, H. L. and Lok, A. (2014). Hepatitis B virus infection. Lancet 384(9959): 2053-2063. Wingfield, P. T., Stahl, S. J., Williams, R. W. and Steven, A. C. (1995). Hepatitis core antigen produced in Escherichia coli: subunit composition, conformational analysis, and in vitro capsid assembly. Biochemistry 34: 4919-4932. Yu, M. and Summers, J. (1994). 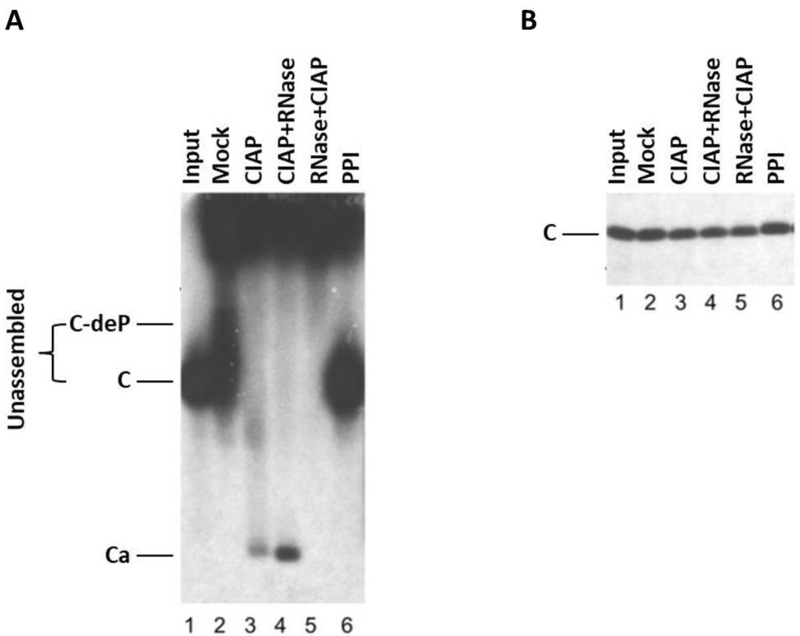 Multiple functions of capsid protein phosphorylation in duck hepatitis B virus replication. J Virol 68: 4341-4348. How to cite: Liu, K. and Hu, J. (2018). Host-regulated Hepatitis B Virus Capsid Assembly in a Mammalian Cell-free System. Bio-protocol 8(8): e2813. DOI: 10.21769/BioProtoc.2813.